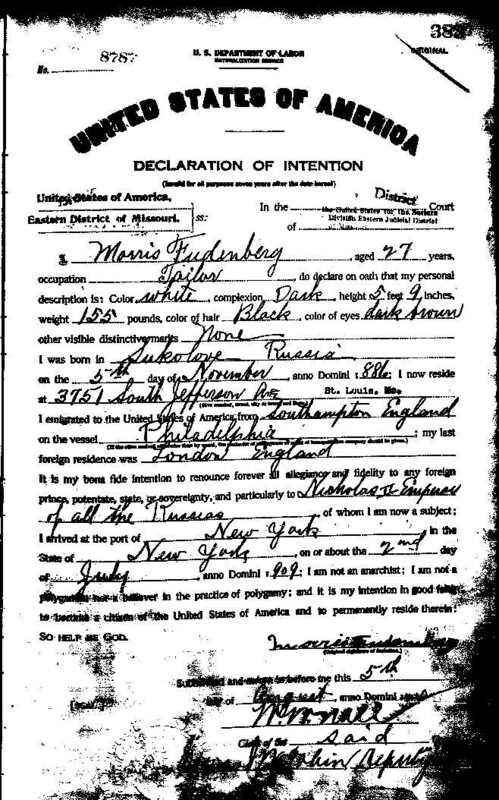 This week, I look at the Declaration of Intent for Morris Fudemberg (1883-1971). He married Nellie Newmark, who was the sister of my great grandfather, Barney. I, Morris Fudemberg, aged 27 years, occupation tailor, do declare on oath that my personal description is: Color white, complexion Dark, height 5 feet 9 inches, weight 155 pounds, color of hair Black, color of eyes dark brown other visible distinctive marks none; I was born in Sukove, Russia, on the 5th day of November, anno Domini 1886; I now reside at 3751 South Jefferson Ave St. Louis, Mo. I emigrated to the United States of America from Southampton, England on the vessel Philadelphia; my last foreign residence was London, England. It is my bona fide intention to renounce forever all allegiance to any foreign prince, potentate, state, or sovereignty, and particularly to Nicholas II Emperor of all the Russias, of whom I am now a subject; I arrived at the port of New York, in the State of New York on or about the 2nd day of July, anno Domini 1909; I am not an anarchist; I am not a polygamist nor a believer in the practice of polygamy; and it is my intention in good faith to become a citizen of the United States of America and to permanently reside therein: SO HELP ME GOD. Subscribed and sworn to before me on this 5th day of August, anno Domini, 1914. Clerk of the said Court. 1) Morris arrived in America in July of 1909, only four months after his future wife, Nellie, arrived. I learned from the Fudemberg family that Morris was a successful tailor, with then-Prince George as a client. (Which, if true, meant he likely worked for Davies and Son.) But he left that behind and started a career in America, because he had to follow love. 2) Morris's European town of origin, Sukolov Russia, matches that of his brother-in-law, Charles Cohen. The Newmark-Fudemberg and Newmark-Cohen weddings both occurred on January 30, 1910. This leads me to wonder if Morris and Charles knew each other in Sukolov, though I haven't yet answered that question. Sukolov likely refers to Sokołów Podlaski, Poland, which is 80 km east of Warsaw. It's also only 125 km Northeast of Warka, Poland, where Nellie and Bella were born. Civil Occupation Codes: What's Going On Here? Does the I Ching have the answers I seek?